When a family is grieving, cleaning house and cooking should be low on their list of priorities. Miller Funeral Services & Cremation Society of Texas has a longstanding relationship with an outstanding local catering service. We have found them to be highly reliable and they offer a wide variety of menu choices. Holding your reception here after the service makes for one less cause of stress at this difficult time. We are happy to work with you. Prices depend on the number of people who will be attending and the menu you choose. 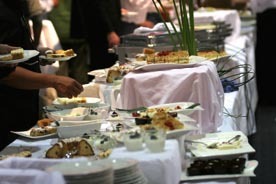 We will work with your budget to offer an elegant reception at a very reasonable cost.